When you see the word “compact”, you often think less. Less power, less performance, less quality. The Tiger Cat is exactly opposite of that. Its compact size improves its maneuverability and performance in tight spaces or smaller jobs. The mower was known as a Tiger Cub in previous years. While the name changed slightly, the standard of excellence remains the same. Quality and durability are first noticed on the Tiger Cat’s frame. Made of heavy-duty tubular steel, the frame provides a strong base for the mower ensuring a lifetime of service. The Velocity Plus cutting deck features a Tri-plate design making the deck top nearly ½” thick. The Tiger Cat has a heavy duty Ogura GT3.5 electric PTO clutch with 250 ft. lbs. and a powerful drive system with dual 10cc pumps and high torque cast iron wheel motors. Kawasaki, Kohler, or Briggs powertrains are available for the zero-turn Tiger Cat. These powerful engines mated to the Velocity Plus deck make a serious zero-turn lawn mower for turf enthusiasts to consider. The Velocity Plus deck comes in sizes from 48” to 61” to best suit the needs of homeowners and landscapers alike. Triple Marbain cutter blades are driven by a heavy-duty spindle made of a high-strength, hardened steel alloy. 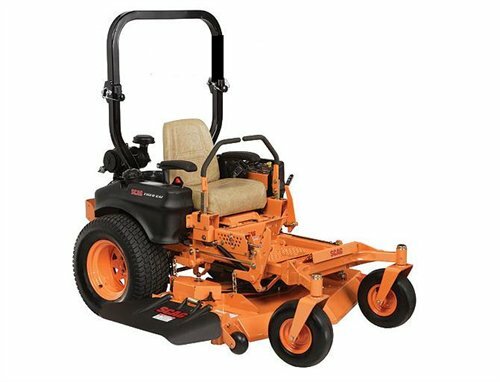 The unique deck design and adjustable Custom Cut Baffle give the Tiger Cat premium mowing performance. Add a top ground speed of 10 mph forward, and 4.5 mph reverse, the Tiger Cat easily rises to the top as a proven performer. Keep your Tiger Cat serviced and maintained with OEM replacement parts from ScagOemParts.com. Find and order parts quickly and easily with the online search tool option.